I know I read the novel, The Secret Garden, many years ago but I only have a vague memory of the story. After seeing the beautiful musical adaption at the Playhouse in the Park, I feel a need to revisit this classic piece of literature. THE SECRET GARDEN, for those who don’t know, is the story of a young orphan girl named Mary Lennox who is sent to live with her grieving Uncle Archibald and his array of servants. There’s also his brother, a doctor, who is caring for Archie’s ailing son – the baby who was delivered that resulted in Archie’s wife, Lilly’s untimely death. The son, Colin, is bedridden and nasty. But Mary Lennox is no meek young lady. Having her in the house changes. . . well . . . everything. While a family-friendly show, I’d be cautious bringing children. There are some dark themes, intense moments, and at times the show moves by at a snail’s pace. It’s certainly not a “kid’s show.” However the luscious score, the incredible voices, and the dynamic charisma between very talented child actor, Anthony Frederickson, and the astonishingly young-looking Caitlyn Cohn make it a worthwhile night – or matinee – out. The highlight is the stunning duet of “Lilly’s Eyes” sung by Kevin Earley and Adam Monley that almost earned itself a standing ovation in the middle of Act One. The orchestra – played behind the stage – is so good I forgot they were there. The set, a storybook with moving parts and surprises contained within, is inspired. 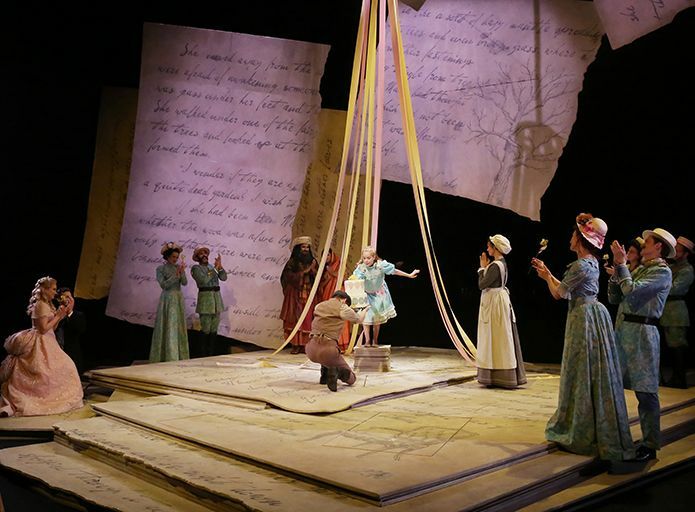 And Marcia Milgrom Dodge’s direction is unique and maximizes the unique Marx Theatre stage’s potential while keeping the story full of fanciful imagery. I’d recommend it for fans of the story, fans of the score, or fans of the genre. Take a look. THE SECRET GARDEN runs through October 3rd at the Playhouse in the Park. Click here for tickets.